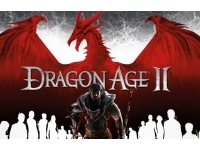 After the disappointment of Dragon Age: Origins, which diluted the franchise down to the simplistic some of its parts, BioWare has returned to the more traditional roots of the RPG genre with the impressively immersive Dragon Age 2. And the gaming experience is all the richer for it. You play the character of Hawke, who, after surviving Darkspawns horde’s destruction of Lothering becomes the Champion of Kirkwall, (the city in which the game is based) The player’s progress in the story is narrated in a non-linear flashback fashion and centered on the choices you make. 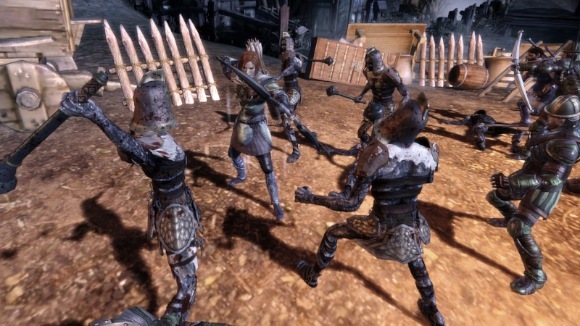 As a further pay off to players of the previous Dragon Age games, your choices and saved information can be imported into Dragon Age 2 and will have an impact on the backstory of the game. Kirkwall is on the brink of war and the Chantry, who are leading religious theocracy are becoming more fractured by the minute adding to rising tensions in the narrative. Whats more, the mystery is further compounded by the realization that Hawke’s Dwarf friend Varric is being interrogated by Cassandra, a seeker from the Chantry. This interrogation furthers the story itself. As your actions lead to the story unfolding in front of you in this unique way, its not known until the end, exactly what your character’s involvement is in the story. What is disappointing is that in spite of this retroactive storytelling format the game is effectively left on a cliff hanger, which leads to an inevitable lack of satisfaction. This particular aspect of the game reminded me of Tex Murphy: Overseer, which was an interactive movie also told in flashback and similarly ended on a major cliff hanger, albeit one that still has not been resolved to this day. But I digress. You choose from your gender and character type: Rogue, Mage or Warrior with differing strengths, abilities and weaknesses you’ll find along the way. As a result of the non linear narrative storytelling, there is no room here for multiple story threads, paths or alternate endings, obviously. The Gameplay is strategic, fast-paced and very satisfying. Of course you can choose to play this as a simple slash ’em up but you can also issue commands to your team mates and position your allies in different strategic areas. However, you’ll need to keep one eye on effective resource management i.e their health. They have a habit of getting themselves killed. The game does feel a tad claustrophobic at times. Being set entirely within the confines of the City of Kirkwall results in you encountering the same locations over and over, although in hindsight I did find the architecture a joy to behold. It’s also important to ensure your on good terms with your friends in the game when possible. At times you will ignore their protests or side with them, either way your actions and behavior toward them will impact on what they think of you. This aspect of the gameplay is in fact intrinsic to the core values of the game’s theme of family and friendship and the importance of the close bond between them. A more diverse bunch of allies your unlikely to find elsewhere and its diversity in the gameplay that adds another element of potential replayability. What has helped to make the game so utterly compelling and immersive are the characters you encounter. Each has their own unique personality, desires, needs, ambitions and motivations. Many of your interactions will be informative, humorous and even at times, heart warming. The strong character driven writing has much to do with this. Graphics do feel like something from 2 years ago. Although the scenery is expansive and pretty, the character animations are a little dated and jittery at times. Despite some of these minor gripes, Dragon Age 2 is a solid combat RPG title with a great story and wonderfully fleshed out characters. 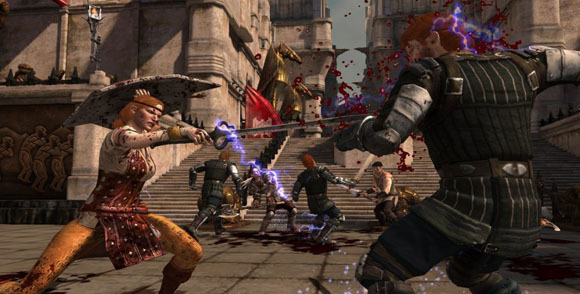 So grab your sword and choose your team, an epic romp throughout Kirkwall awaits.